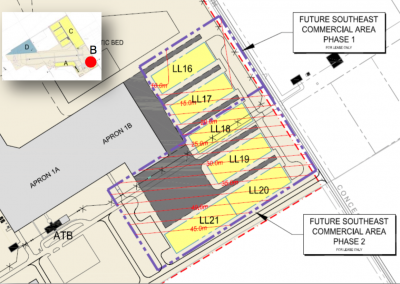 The Lake Simcoe Regional Airport property is situated on 240 hectares (595 acres) of land. 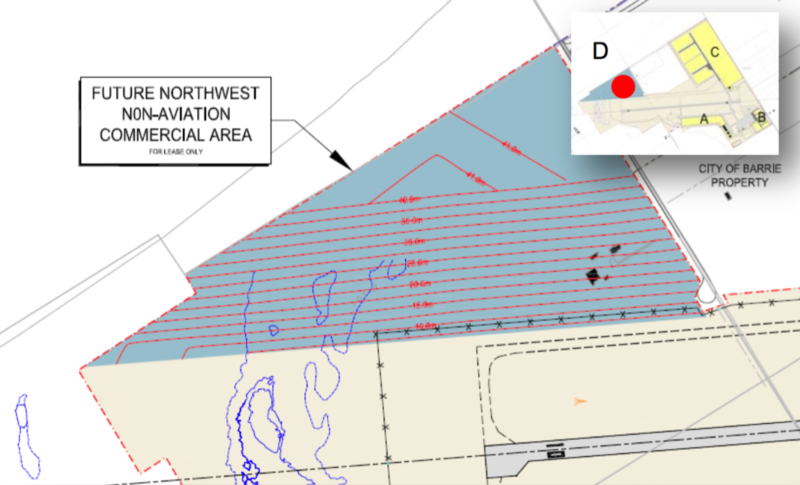 The Lake Simcoe Regional Airport is pleased to offer 58 hectares (142 acres) of serviced and un-serviced land available for airside commercial development opportunities and a further 24 hectares (60 acres) available for non-aviation development. Developed as part of the recent expansion initiatives at the Airport, the Southwest Commercial Area is approximately 6 ha. in area and is divided into 11 potential lots averaging 57m x 102m. 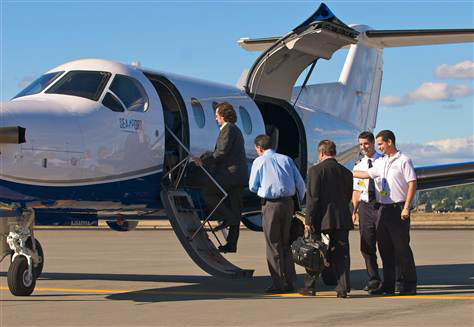 Single lots are appropriately sized to accommodate corporate flight operations, small charter operators, rotary wing operators, aircraft sales and servicing facilities and FBO’s. Larger facilities or operations which require significant apron area can be accommodated on multiple lots. 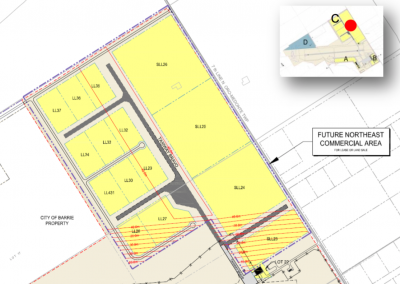 All of the lots in this commercial development area are fully serviced. Airside access for Code C aircraft is provided by Taxiway Delta. Please contact Airport Management for more information on availability. 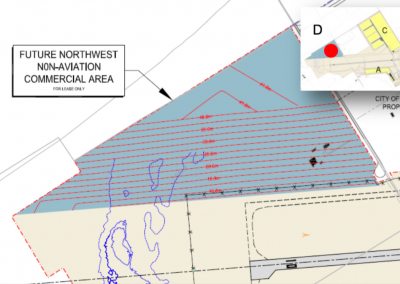 This commercial development area is located in the southeast corner of the Airport property and would generally cater to light general aviation and recreational aircraft. 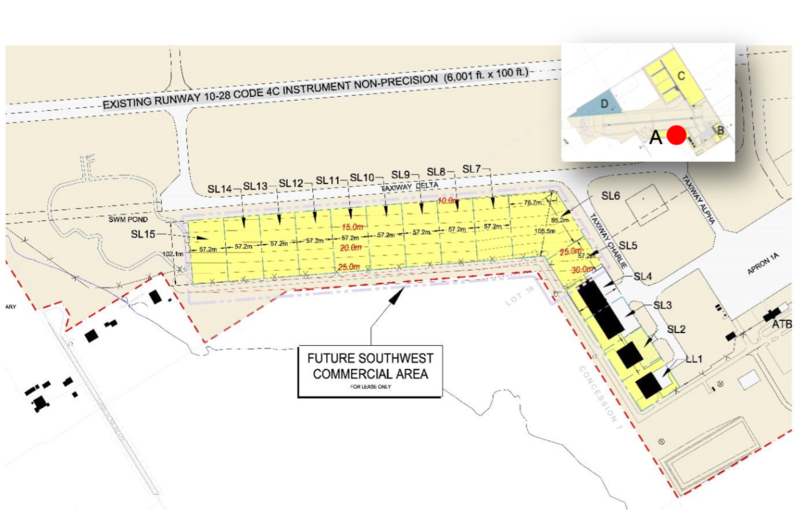 To maximize the development potential of this site in the longer term, the main airport access road and security fence could be relocated to the south. The remainder of the development parcels, totaling 1.9 ha, has been sized to accommodate paved aircraft tie-downs and/or T hangar development. 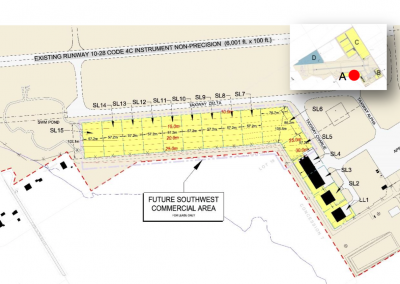 These lots could be further subdivided to accommodate smaller hangar developments. This development area is located north of Runway 10-28 on airport lands located adjacent to Line 7 North. 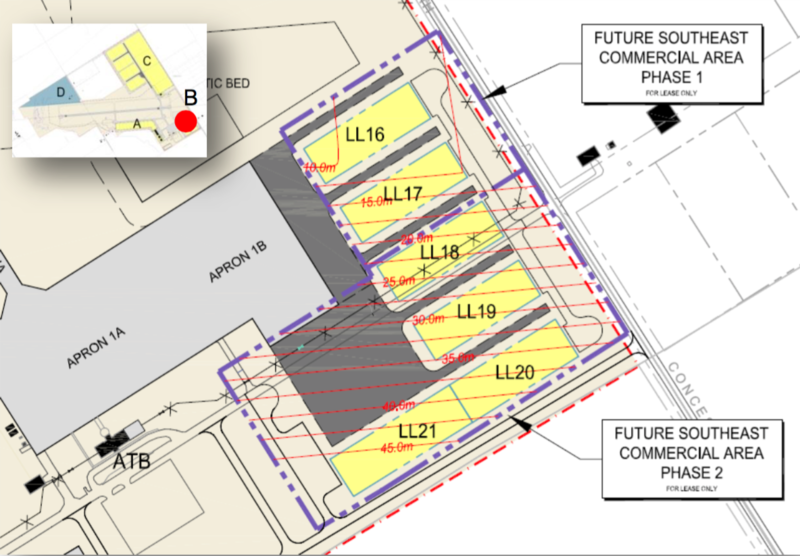 Airside access to the site would be accommodated with the extension of Taxiway Bravo. The primary advantage of this commercial development area is the potential to accommodate large scale development on deep lots. To the east of Taxiway Bravo the lot depth is approximately 290m. Intended uses includelarge MRO (maintenance repair and overhaul) facilities, manufacturing, air cargo/courier operations, airline maintenance facilities, etc. To accommodate intermediate sized development parcels the development area west of the taxiway is provided with sub taxiways which optimize the efficient use of the land. The depth of the lots in this area is 160m. Provision of a stub taxiway located east of Taxiway Bravo could accommodate smaller lot sizes if required. The airport continues to work with aviation consultants to anticipate business growth and map new industrial and commercial development locations that can quickly be developed should investment opportunities arise. The Lake Simcoe Regional Airport is pleased to offer commercial office space for lease in the main Airport Terminal Building. The modern building features main passenger lounge, executive passenger waiting area, pilot lounge, café, executive boardroom and access to both wired and wireless high-speed (Wi-Fi) Internet services. Situated on the airport’s main ramp, the terminal building provides centralized access for all airport clientele. 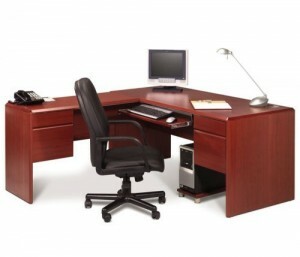 For more information on office lease rates and availability, please contact Airport Management. The Lake Simcoe Regional Airport is pleased to offer an Executive Boardroom located in the Airport Main Terminal Building. The room is complete with ergonomic furnishings and a comfortable boardroom table as well as both wired and wireless high speed internet access and a wall mounted projector screen. For rates and reservations please contact Airport Management. The Lake Simcoe Regional Airport is actively looking to create opportunities for commercial air carrier operations. We would welcome new carriers and destinations that will enhance air service to the businesses and residents of the greater Barrie area and Simcoe County.